Log homes often feature dramatic rooms with soaring purlins and open floor plans. Many times these larger common rooms are centered around a beautiful fireplace, a great view or a communal kitchen designed for entertaining. Lighting these rooms can be achieved while adding a statement when the right chandelier or fixture is found. Chandeliers can take many shapes, but a primary feature is suspension from a ceiling to illuminate the area below. 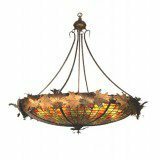 It is a good idea to identify areas where a chandelier might be appropriate lighting early on in the planning process, so that electrical wiring can be drawn to the appropriate spot. Getting the right balance for a chandelier in a room is an important step. Considerations include what the light will be illuminating, (a table, a seating area, a foyer), the height of the ceilings and the dimensions of the room. A simple trick for sizing a chandelier is to add the length and width of the room together (30 feet by 15 feet = 45) and then convert that to inches (45 inches). If the surface to be illuminated is a table and that seems too large, size the chandelier at ¾ the length of your table. Decorators say that the most common mistake in sizing statement lighting is going too small for the area. If your chandelier is a beautiful work of art, erring on the larger side in a large room is better than undersizing it. Once you’ve got the sizing, you can start to shop for the right fixture. 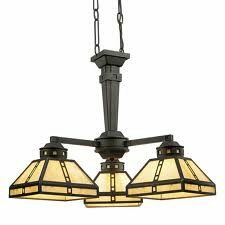 Architectural salvage companies in your area can provide some interesting antique or industrial lighting options for a counterpoint to your other interior pieces. Several websites also offer rustic designs if that is your creative preference: antlers, stained glass, stamped metal and cast iron offer motifs that work well in log homes. 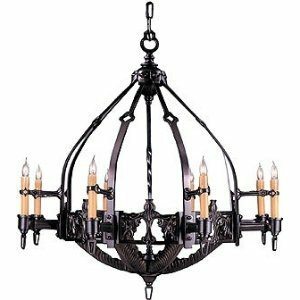 The House of Antique Hardware is a great place to start, as they offer chandeliers in seven different categories, from Arts and Crafts to Tudor revival. For the traditional rustic style of lighting, take a look at The Cabin Shop, which offers a search tool to find specific features, such as western or wildlife.